Meet Billy, one of our favourite Geordie’s who flowrided his way from Newcastle to the crystal-clear seas of Jamaica, Mexico, St Juan and many more. This was all whilst getting paid to be member of the sports team aboard Royal Caribbean, Oasis of the Seas. Royal Caribbean is one of the most prestigious cruise liners in the world and we’re privileged to be their preferred recruitment partner. We only hire the best of the best and last year, we placed 99 candidates with Royal. Travelling the beauty spots of the world and forging lifelong friendships with likeminded explorers along the way are just a few perks of working for this great company. Billy began his sports career with the completion of his BTEC Level 3 in Sport. Most colleges and sixth forms in the country run BTEC Sports courses, and like A-Levels, they take between one to two years to complete. If you set your sights on it, this get-paid-while-you-travel lifestyle is achievable for everyone. You just need a sport-related level 2 BTEC to step on board your dream job. Following achieving his relevant qualifications, Billy then went on to lifeguard for Princess, followed by a year in China coaching under twelves in football. Having returned from China to a lifeguard role on board Carnival Cruise Lines, Billy decided that a more hands-on, sporty role was for him. That’s where we came in! He secured a position through us as sports staff aboard Royal Caribbean. During the day on the Oasis, Billy was a master of the zipline, the king of the rock wall and an expert in delivering Ping-Pong and soccer tournaments. Off-duty he liked to further improve his fitness by swimming and going to the gym (which is all included in the job package, along with meals and accommodation). For personal leisure, he’d play darts and chill out in some of the world’s clearest oceans. Not a bad life, is it? When asked about his favourite memory, Billy said: “Diving is amazing and Cozumel has the most beautiful beaches.” He even got to meet one of nature’s most fascinating sea-dwellers whilst scuba diving; dolphins! It’s the responsibility of sports team members like Billy to ensure the guests holidaying on board have a great vacation with friends and family. For them, it’s all about having fun and relaxing, enabling the team to do what they love – deliver sports and games in an amazing atmosphere. All guests get the opportunity to take part in the dynamic, engaging and inclusive recreational activities which the sports staff help to oversee. Those who work on Royal Caribbean cruise liners are on board for 6-months and 3 weeks at a time, with short breaks in-between contracts. Billy has recently completed his first contract with Royal. He has sailed around picturesque, white-sand beaches and climbed cannons (for Instagram candids, of course) for just over six months! 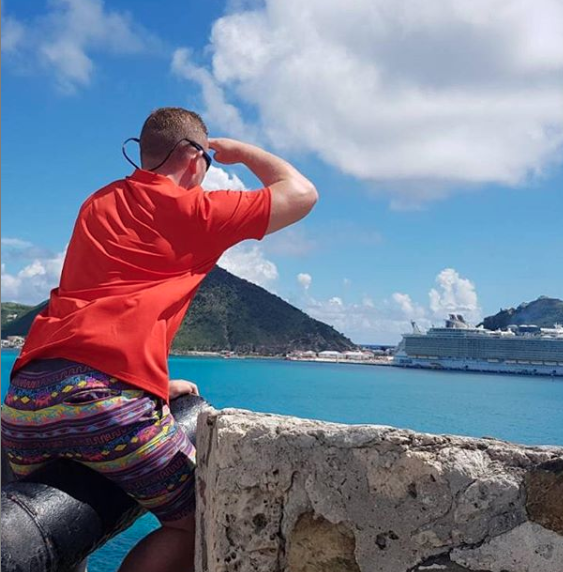 Although it might seem daunting to some at first, setting foot on a cruise ship as sports staff is more than a sight-seeing adventure; it’s a story of personal growth, friendships, sporting activities and fun. Utilising your sports skills and building relationships with colleagues, crew and guests will create memories that last a lifetime, in locations you’ll never forget. If an ordinary life just isn’t for you, take a look at our sports staff job description and apply now!